The Liverpool Ladies Sister Club programme was officially launched in February 2017, allowing five local girls teams the chance to affiliate with Liverpool Ladies FC to develop and inspire the next generation of players. The five spots were quickly filled by some of the most progressive clubs in Merseyside and Cheshire and they have enjoyed a number of activities in the past four months. The first two games of the year saw LLFC host Everton and Notts County in the Women’s FA Cup. We were joined by all our Sister Clubs, with Crosby Stuart and Bromborough & Eastham having the opportunity to act as mascots and ball girls, including a special chance to meet Martha Harris before the Notts County match. 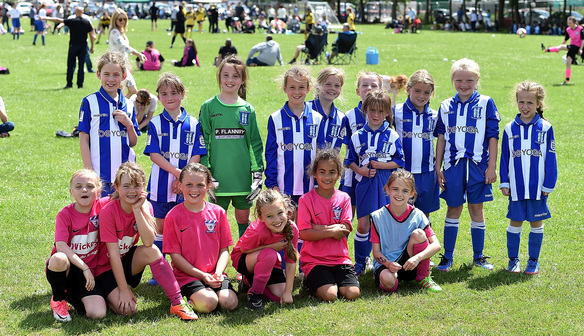 In April, we invited Sister Club girls to join us in the FA’s ‘Make Dreams Goals’ campaign. In addition to entering the competition they got to meet LLFC captain, Gemma Bonner, and goalkeeper, Siobhan Chamberlain, who told them all about their own footballing goals and dreams. One of our Sister Clubs was involved in the launch of the new sponsorship agreement between Liverpool Ladies FC and Avon, with Bromborough & Eastham girls featuring in the video created to mark the occasion. It as a busy time for the club, as they then joined us for their Sister Club Day at the end of the month when we hosted Reading for the first WSL1 Spring Series match. May was a busy time for the Sister Clubs; Crosby Stuart and Frodsham made the trip down to Wembley to take part in the Sister Club parade at the SSE Women’s FA Cup final. We also had our second Sister Club Day with Crosby Stuart joining us for our game against Sunderland, while Frodsham hosted LLFC players Martha Harris and Caroline Weir at their end of season presentations the following evening. Ahead of our away game against Chelsea we invited Sister Club coaches to an open first team training session; in addition to watching the players being put through their paces they got the chance to spend some time with Scott Rogers and his coaching team for a Q&A session. On June 3rd, we invited the Sister Clubs and selected teams to the inaugural Sister Club tournament. With over 500 girls from U8’s through to U15’s taking part and opportunities for newly qualified young female referees to develop their skills, it was a great morning of football. In the afternoon Sister Clubs were invited to the Liverpool Ladies FC v Manchester City Women WSL1 match, for our last game of the season. As a special treat, we held a meet and greet session after the game, giving players the chance to thank fans and Sister Clubs for their support during the Spring Series. With all clubs winding up for the season, we had invites to more award ceremonies, with defender Ellie Fletcher attending Lymm Rovers presentation evening and development player Mia Parry joined Bromborough & Eastham at their end of season event.